The Blue Jays International Free Agent class of 2012 was a decent one. Not as good as the 2011 class, which featured Roberto Osuna, Jairo Labourt, Dawel Lugo, Jesus Tinoco, and Alberto Tirado, but a quality one just the same. Led by top signing SS Franklin Barreto, who is now Oakland's top prospect after being the centrepiece of the Josh Donaldson deal, the Jays also inked SS Richie Urena (now one of Toronto's top prospects), and LHP Jonathan Torres to six-figure signing bonuses. Lost in amongst the signings that year was one that took place several months later (and for far less bonus money) of RHP Francisco Rios, out of Monclova, a city of just under 200 000 in northern Mexico, not far from the border with Texas. Late IFA signings are the guys who didn't have enough (or show enough) to warrant signing during the Teenaged free agent frenzy that is the July 2 signing date. They might be older, or not toolsy enough, or lacking in physical traits. In Rios' case, at 6'1", his height most likely led to him being overlooked. The Blue Jays saw enough in Rios' athleticism to sign him. While his numbers have not been spectacular, the organization saw enough physical and emotional maturity in him to skip him over the GCL in favour of the Appalachian League when he made his stateside debut in 2014, and advanced him to Vancouver last year, where he was a regular in the C's starting rotation. This year has been a huge coming out party for the righthander. 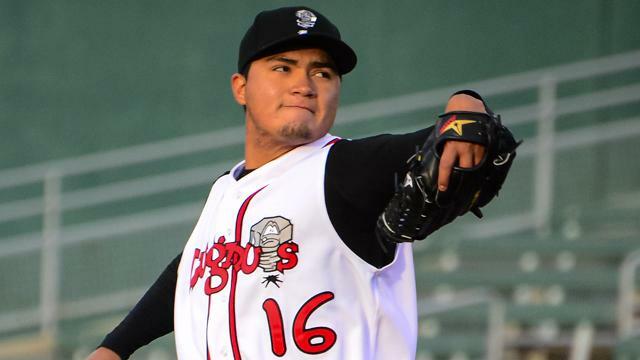 Rios has been brilliant at Lansing in his first shot at full season ball, striking out 12.9 batters per 9 innings, to go along with a tiny 1.20 ERA. After following Rios for much of last year, I wasn't expecting a great deal this year. After finally getting eyes on him during his May 1st start against Wisconsin, I'm now a believer. Rios has a polished delivery which he repeats consistently, and throws from a three-quarters arm slot. He commands both sides of the plate with his fastball - his two seamer has good sink and some tailing action. He throws a four seamer up in the zone with two strikes on a hitter in order to get some swings and misses, but had trouble commanding it during this start. His slider is emerging as a potential wipeout pitch, starting out looking like a fastball, then diving for the outer half of the plate to barrel-dodging country at the last moment with good depth. Three of his 5 strikeouts on the day came on that pitch. Rios also throws a 12-6 curve, which is a work in progress, and threw one or two changeups on the day. His fastball is his bread and butter, however, and while he only topped 93 with it in this start, his ability to pound the lower part of the strike zone with it sets up that slider. Rios breezed through the first four innings of this start against a Wisconsin team that is not loaded with top prospects, but does contain some mid-level bats like Jake Gatewood and Monte Harrison. Rios faced only one batter over the minimum through four, needing only 45 pitches to do so. He attacked the strike zone, consistently getting ahead of hitters over that stretch, never reaching a three-ball count. In the 5th, Rios gave up his first hits and hard contact on the day, but left a pair of runners stranded. Things came a bit undone for him in the 6th. Facing Rios for the second time, Wisconsin hitters turned more aggressive, and were going after his first pitches with regularity. Lansing SS JC Cardenas had to field a grounder on the second pitch of the inning on a short hop, and rushed his throw to first, where converted Catcher Juan Kelly was unable to come up with it for the out. A Rios wild pitch put the runner into scoring position, and he came around to score on a solid line drive base hit. Another single put runners on first and third, and Lugnuts C Ryan Hissey had a bit of a brain cramp, as he failed to check the runner on 3rd before throwing to 2nd to try to throw out the runner attempting to steal. The runner from 3rd came in to score easily. Rios was out of the inning a few batters later, having given up a third run. He gave up some contact in that inning, but his defence let him down a bit - two of the runs were unearned. On the day, Rios threw 82 pitches, 59 for strikes. He had 9 swinging strikes, and was ahead in the count after three pitches to 22 of the 25 hitters he faced. Rios threw 7 ground ball and 7 fly ball outs - while he only gave up two fly balls that could be considered to be of the loud variety, he was helped by the strong Wisconsin spring wind blowing in from rightfield. It was not televised, but Rios had an even more dominant outing on his 21st birthday, May 6th. Rios allowed only one hit in 5.2 innings, fanning 10. He struck out the side swinging, and K'd 6 of the first 7 hitters he faced. Chad Hillman, a Michigan-based prospect hunter, had him hitting 95 with his fastball. Rios has struck out 43 batters (2nd highest total in the MWL) in 30 innings this year, and has walked only 8. After three seasons of only moderate success in the minors, it would appear that a bit of an uptick in velocity, more bite on his slider, and improved fastball command have made things look ridiculously easy for him - MWL hitters are simply overmatched when they face Rios. I'm as enthused as anyone about Rios' performance so far this season, but with lower level arms, you have to take a more patient approach, and see how they fare second time around the league, and after that, how well they make adjustments at the next level, where hitters can get around on a fastball better, and have improved pitch recognition. With Rios, Angel Perdomo, Sean Reid-Foley, and a rapidly improving Jon Harris in the rotation, Lansing is a must-follow team at the moment.